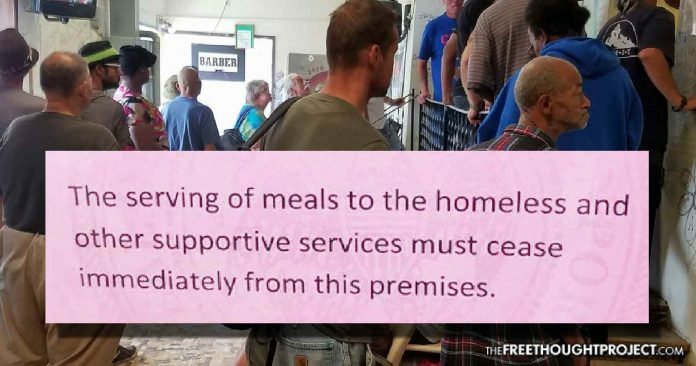 Davenport, IA — A church in Davenport, Iowa, facing zoning restrictions related to its outreach program to feed the homeless, is appealing its local council and questioning the legality of the city’s regulations. This all stems from a cease and desist order they received — because feeding the homeless is not allowed when you’re zoned as a church. Pastor Jim Swope founded Timothy’s House of Hope in 2009 and is associated with Compassion Church, which was founded by Pastor Nick Cantwell. One of the primary missions of the church is focused on outreach to poor and homeless individuals, offering addiction resources, haircuts, a food pantry, clothing, and meals at no charge, according to the ministry’s website. Timothy’s House of Hope center has estimated thousands of meals served each month. While the House of Hope was allowed to serve meals at the 4th Street location, their move to Washington Street is reportedly in violation of zoning ordinances. The church is permitted to operate on Washington Street, but “services to the homeless” are prohibited due to zoning regulations, according to the Quad-City Times. The city appears to have taken a general position of seeking to abide by zoning regulations. Davenport Mayor Frank Klipsch told WQAD News 8 that “We can’t let this be interpreted in any way that we do not support the great work that timothy house of hope is doing,” and has said that the city is reaching out to the city attorney to check the possibility of re-opening as the zoning issues are addressed. In the meantime, however, to hell with the homeless people who need the food. They can starve whilst the church files the proper paperwork and red tape to help people. In addition to the zoning issues, Swope has claimed that Davenport Alderman Ray Ambrose is specifically opposed to the notion of a homeless outreach center operating on Washington Street. According to Swope, Ambrose confronted him and “just lit into me and said he didn’t want bums on top of the hill” following the center’s relocation. Drew Klein, state director for Americans for Prosperity-Iowa, shared his thoughts on the controversy. “It is truly appalling that city officials are citing long ignored zoning regulations to shut down a ministry that has done nothing but serve underprivileged members of the Davenport community,” Klein noted. “Shuttering a ministry that is doing incredible work in the community is probably not what their voters had in mind,” Klein added. Klipsch reiterated that the city was hoping to work with the Compassion Church and Timothy’s House of Hope to reach a solution and that the issue was presented to the city as a zoning problem, not an act of opposing the work of the church.